If you have ever tried to find the ‘right’ emergency food company to buy from, you may have seen just how many of them are out there. They all make similar claims about being the best for various reasons. It can be extremely overwhelming. Whatever your reasons for buying some long term emergency food in the first place, it can leave you feeling frustrated and tempted to just throw your hands up and put it off. I cringe when I hear this for several reasons. The purpose of this article is not to tell you which one to buy, but more to arm you with some criteria so you can choose the best one for you and your family. 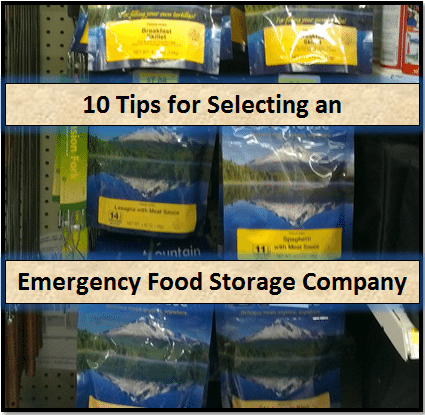 10 Tips for Selecting an Emergency Food Storage Company (not in any particular order). Price per meal. Single packs are more expensive than buying in bulk. It is also important to pay attention to how many servings are in each bag. Some companies have large 4-serving pouches of dinner entrees, while others might contain just 2 servings. This affects the price per meal. Method of cooking. Some companies sell their meals in pouches that allow you to pour boiling water directly into them and let them steep, much like cup-o-noodles. Others require a pot and fire or other heating source to cook them. Consider your situation and where you see yourself actually using these meals. Will you have a pot to use? Do you have other ways to heat water and food if the power goes out? Ingredients. This is very important. Because you are looking at food to be used during an emergency, high quality food is more important than ever. 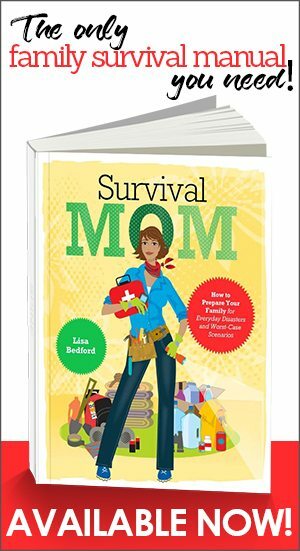 Filling up on a bunch of chemicals and preservatives will have a greater negative impact should you find yourself surviving a disaster than just sitting on a couch. Just because you’re buying emergency food doesn’t mean you have to sacrifice your family’s health. Caloric value per serving. This ties in with the ingredients criteria. Going ‘low fat, low carb’ is not the smartest option in an emergency and a SHTF situation is no time to worry over eating too much. You will absolutely be burning more calories than you do on average, especially if you are bugging out. Pay close attention to how many calories you will get per serving. Make sure you are getting at least 1800 a day per adult to maintain your body’s systems. Taste. Hunger will only go so far in making food taste good. Some companies offer a free sample or smaller containers so you can taste their product, and I highly encourage you to take advantage of it. If you never try the food until you need it to survive, you may be in for a nasty surprise. Taste plays an important role in not only palatable sustenance, it can improve morale and overall feelings of ‘normality’ which will be a precious thing in a catastrophe. If you cannot get a free sample, look into buying just one or two pouches. See if the company sells single packs via the internet or in chain stores such as Walmart, REI, Cabela’s, and others. Specialized diet options. Do any of the people in your group have allergies to certain foods? Is anyone vegan or have other special needs? 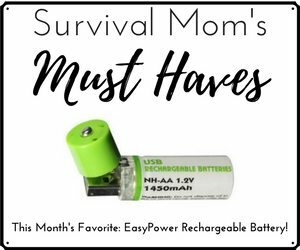 There are companies out there who offer large varieties of packages that suit pretty much everyone’s needs. Do they offer packs of just one item such as a bucket of freeze dried chicken? While getting a 1 month bucket for each family member is wonderful, each person will still have the same foods to choose from and it will get boring. Companies that offer supplemental foods such as rice side dishes or dried fruit will make for a nice variety. What kind of variety? Can you combine to make new creations? Companies that do not have much of a variety should be avoided. At some point, you will need to get creative and extras on the side will help greatly. Depending on the time of year, you may be able to forage or hunt for some of your food and only need to add some freeze dried chicken or dried mixed veggies to make a meal. Weight. Weight is a consideration mostly for those who are bugging out. You do not want to have a pack so heavy that you cannot make it 2 miles. Optimal storage conditions and shelf life. You want to get high quality food, but you also want something that will last a good, long time. Look into what the optimum storage conditions are and how long the food will last for that time. Then factor in what kind of storage conditions you have available and go from there. Ask yourself if you think food that should last 20 years in perfect storage conditions will only last 10 years in the conditions I have – is it still worth it? Can I improve the conditions? I know I’m not ‘normal’ in what I consider for survival, but for me, #3 should be FIRST on the list. I have seen ads for many long term storage food companies, and not one of them has my first requirement that the food be non GMO, no chemical ingredients and…..yep, HAS TO BE ORGANIC! I know that organic is more expensive, but why survive whatever we are surviving only to be devastated by ill health or disease or early death due to the toxins in most of todays traditional food supplies? I have found only one source that does have organic pre-packaged foods, that I can store long term. It took me a long time to find them, but I won’t be taking those great ‘discounts’ on food that, to me, is not worth it in terms of my family and my health needs in a survival situation. What company is it? Organic and non-GMO is important to me too! Please name the company, I have had a hard time finding organic storage food as well! Thank you for the comment! I did not put the list in any particular order because everyone has different needs and preferences. It was my intent to arm people with some solid considerations before they bought anything. 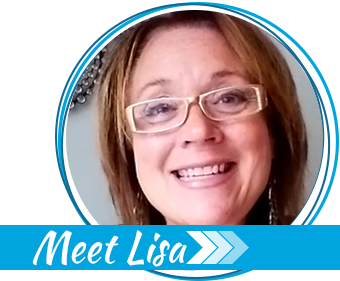 You are far ahead of the game having already found a company that works well for you and your families preferences! I am sorry, I found this article a disappointment. Rather than tell US what to look for, how about doing some testing and make specific recommendations? Is Mountain House better than Provident Pantry? Who has the best deal when shipping is figured in? Is it better to buy in bulk from EE or Pleasant Hill? Perhaps a forum would be a good idea- Just to get things started my wife says Provident Pantry low fat cinn. app. granola tastes rancid to her. She makes her own granola, so her standards are quite high. I was happy with it but I have almost no taste buds. I really like MH chili/mac from WalMart. Thank you for your helpful site! God bless. PS: The best deal is in your own yard! My potatoes are almost 3′ high, I hope there is something growing under them. We never planted potatoes before, I have high hopes. The garden offers you non-GMO, pesticide free, fresh produce. I encourage all to try it. I was inspired by a film “Back to Eden”. Deep mulch, no till, less work, weeding and watering. Thank you for the comment Unca Dave. I will happily why I wrote the article the way I did. First, it is far too expensive for me to buy a pack from all of these companies and try them out. Not to mention the calories!! The second and main reason is this: How can I possibly determine what would be right as far as taste, standards, and costs for you and your family? That would be presumptuous and illogical. I would not presume to tell people that Brand A’s oatmeal breakfast tastes better than Brand B’s. My taste buds are different from theirs. Finally, it was and still is my intent to give people solid criteria to use in order to make the decision that is right for their family. 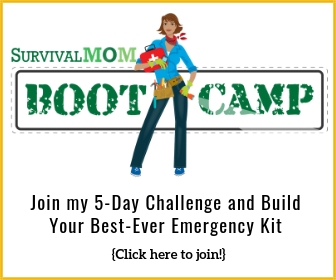 As you pointed out, there are so many options and companies that it can be overwhelming for someone who is new to overall prepping and food storage. Darn typos! Thank you for following the site Unca Dave. Please advise on the source of organic foods. As a physician, and one who suffers from MCS due to pesticide exposure, this is a HUGE issue for me. PS: LeAnn, any idea about the company to which Carol is referring? Clay, a couple of companies sell certified organic foods in larger quantities: Thrive Life and Mountain House. There are companies that sell small pouches of organic freeze-dried foods, but at the prices they charge, you’d spend an enormous amount of money stocking up on any significant quantities. I just read Unca Dave’s comments regarding his potatoes. Those who wish to grow their own emergency food supplies should understand this: when the food supplies in the cities are depleted (worst case “chaos” scenario), thousands of hunger-driven people will then move through the suburbs, taking all that they can take from the suburbanites who have not adequately protected themselves and their properties. Rural areas will be next. Gardens will be easy targets for the hungry hoards. If you plant your own food supply, you should be prepared to defend it, 24-7, which includes defending YOURSELF AND/OR YOUR LOVED ONES. Purchase some defensive weapons, and I DON’T mean brass knuckles or bows and arrows! Food will not be the only thing in short supply; use your imagination. Exactly. What we have will not be enough. People will hurt you to geed their family. It isnt going to be a real friendly place to be when tshtf. So which company do you recommend based upon the 10 criteria you listed above?